The largest inventory of collectible stocks and bonds in the world! Over 6 million pieces! Over 3,000 Stocks and Bonds available in our online catalog. Choose from many of the largest and most historic companies. 107 Items. Showing Items 1 thru 20. 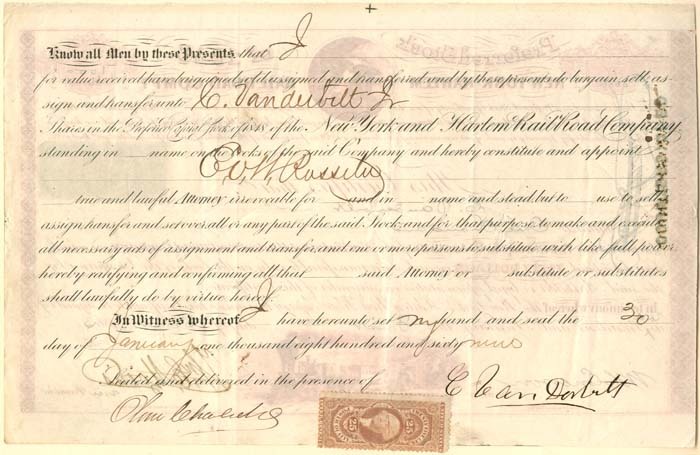 New York and Harlem Railroad - Issued to and signed by the Commodore Cornelius Vanderbilt! State of CT with Charles Hopkins - signed by Oliver Wolcott, Jr.
State of New York Comptrollers Office RARE!